The area of present-day Sudan formed the powerful kingdom of Kush from around 1000 BC to the 4th century AD. After the decline of Kush, various successor Nubian kingdoms were established as separate polities. Christianity arrived in the region around 500 AD, and Islam was gradually introduced into the north from the 7th century, influenced by close relationships between the Nubian kingdoms and Egypt. In the 16th century the Funj empire became the main power in in southern Nubia, lasting until invasion by Egypt in the early 19th century. In the late 19th century the Mahdist group resisted Egyptian forces and gained control of most of Sudan. The British eventually helped Egypt regain control, and Sudan became nominally a British-Egyptian concern, although in actuality governed mainly by Britain, from 1899 until independence in 1956. Two civil wars dominated the following decades: the first from 1955 to 1972, and the second from 1983 to 2005. A factor in both wars was the perceived marginalisation of the southern population by the northern-dominated government. The area of present-day Sudan has a dominantly Arab and Muslim identity, distinct from the traditionally Christian or animist Dinka, Nuer and other Nilotic peoples who make up much of South Sudan’s population. In 1972 South Sudan was designated an autonomous region, and a referendum in 2011 led to it seceding as an independent state. Controversy continues between the two countries over disputed oil-rich land. Other conflict has focused on the Darfur region in western Sudan, which had been largely autonomous until absorbed into British-ruled colonial Sudan. Conflict over its status erupted in 2003, linked to disagreements between ethnic and cultural groups identifying as Arabic and African, respectively. Conflicts between herding and arable agricultural livelihoods have also played a role. Sudan’s economy has long been dominated by oil revenues, and the secession of South Sudan, with over 80% of the former Sudan’s oil reserves, led to significant loss of revenue after 2011. Even with the former oil revenues, Sudan faced major economic problems and remains poorly developed. Agricultural remains the main livelihood activity for most Sudanese people, contributing over one third of GDP. There is a small amount of irrigated agriculture, but most, including a large livestock sector that maintains exports, is rain-fed. Government efforts to diversify the agricultural economy include developing new products such as gum arabic. A major dam project generates most electricity for the country. Sudan is water-poor, with semi-arid or arid conditions in much of the country. The only major permanent rivers are the Blue and White Niles, on which there are several dams. Lake Nubia on the border with Egypt is the only major lake. There are major stores of groundwater in the Nubian sandstone aquifer, but usually at considerable depth. Groundwater is widely used for drinking and livestock watering, but most irrigation uses surface waters from the White and Blue Niles. Please cite this page as: Gadelmula, Upton, Ó Dochartaigh and Bellwood-Howard, 2018. Sudan. Map developed from USGS GTOPOPO30; GADM global administrative areas; and UN Revision of World Urbanization Prospects. For more information on the map development and datasets see the geography resource page. Border countries Egypt, Eritrea, Ethiopia, South Sudan, Central African Republic, Chad, Libya. The centre and north of Sudan are extremely dry. Rainfall increases towards the south. There are distinct wet and dry seasons, with the rainy season in the north between July and September, and in the south between June and November. 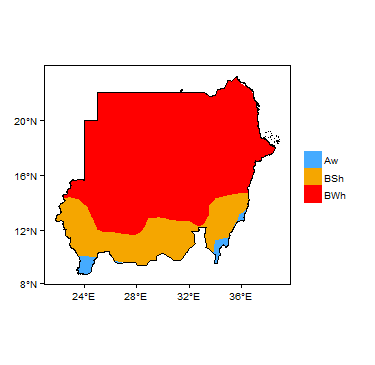 More information on average rainfall and temperature for each of the climate zones in Sudan can be seen at the Sudan climate page. The Nile rivers are the major perennial rivers in the country. The Blue Nile is joined by the Dinder and Rahad rivers between Sennar and Khartoum, and joins the White Nile at Khartoum to form the River Nile. There are several dams on the Blue and White Niles, including the Sennar and Roseires Dams on the Blue Nile, and the Jebel Aulia Dam on the White Nile. There is also Lake Nubia on the Sudanese-Egyptian border. The Ministry of Irrigation monitors river flows, and stores dataset going back several decades. Major surface water features of Sudan. Map developed from World Wildlife Fund HydroSHEDS; Digital Chart of the World drainage; and FAO Inland Water Bodies. For more information on the map development and datasets see the surface water resource page. Soil Map of Sudan, from the European Commission Joint Research Centre: European Soil Portal. For more information on the map see the soil resource page. The centre and north of Sudan are dry with areas of desert, such as the Nubian Desert to the northeast and the Bayuda Desert to the east. In the south there are swamps and rainforest. 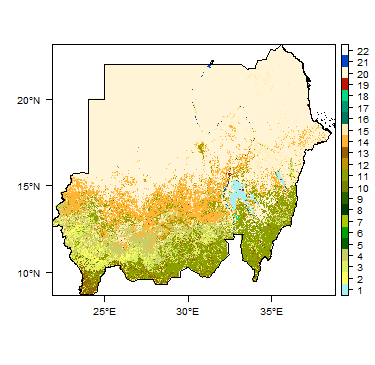 Land Cover Map of Sudan, from the European Space Agency GlobCover 2.3, 2009. For more information on the map see the land cover resource page. This section provides a summary of the geology of Sudan. More detail can be found in the references listed at the bottom of this page. Many of these references can be accessed through the Africa Groundwater Literature Archive. The geology maps on this page show a simplified overview of the geology at a national scale (see the Geology resource page for more details). Other published geological maps are listed in the Geology: Key references section, below. In particular, a geological map of Sudan at 1:10 million scale was published in 1981 and is available to download as a scanned image. Geology of Sudan at 1:5 million scale. Based on map described by Persits et al. 2002 / Furon and Lombard 1964. For more information on the map development and datasets see the geology resource page. Sudan's geology ranges from Precambrian crystalline basement rocks to Quaternary unconsolidated alluvial deposits. There was a long period of erosion from the end of the Precambrian to the late Palaeozoic, resulting in the removal of most of the previously deposited sedimentary cover, with the exceptions of a few isolated outcrops of Palaeozoic sedimentary rocks - such as at Wawa (Kordofan), near the Chad border, near the Jabal Uweinat and in northwest Sudan (UN 1988). During the Mesozoic, Nubian Sandstone deposits were laid down, preserved in basins within the basement and Palaeozoic rocks. Tectonic movements of the Rift system in the middle and late Tertiary led to the formation of vast structural basins, such as the Bara, Dinder and Baggara. A volcanic phase throughout the late Tertiary and into the early Quaternary produced the Jabel Mara and Meidobe basalts and the basaltic flows of the Bayoda desert and the Gedarif region. In the Plio-Pleistocene period, these Tertiary basins became infilled with extensive and thick unconsolidated sediments, mostly alluvial and lacustrine deposits, including the Um Ruwaba formation (UN 1988). These now cover a large part of the country, overlying older bedrock aquifers. The main outcrops of unconsolidated sediments are shown on the separate map of unconsolidated geology, above. A major shear zone, the Central African Shear Zone, runs through the central part of Sudan. Quaternary to Tertiary There are a number of different named formations in this group, which are undifferentiated on the map. The youngest sediments in Sudan include alluvial silts and clays with occasional sands, deposited in the valleys of the Nile and other rivers; Kordofan aeolian dune sands; and black clay plains (UN 1988). They include the Gezira and Alatshan and Gash formations, and have thickness ranging up to just less than 100 m.
Other Tertiary formations are relatively minor and not distinguished on the geological map above. The consolidated Hudi Chert Formation is non-marine and fossiliferous, containing very thin cherts - not more than a few metres - and found in and around the Atbara region. The Abyad Formation crops out in northwest Sudan and comprises mostly marine sediments, including sandstones, limestones and evaporates. Dominantly Tertiary (Cretaceous to Quaternary) Red Sea coastal/littoral sediments are dominantly Tertiary in age, and are formed of continental gravels, sands, silts and clays, and marine coral limestones. There are a number of named Tertiary formations within this group, which form a series of undeformed sedimentary rocks occupying 10-40 km width along the coast, underlying Quaternary unconsolidated sediments. Their thickness can exceed 2 km. Um Ruwaba Formation Late Tertiary to Quaternary The Um Ruwaba Formation occurs in two large trenches in the centre and south of Sudan: the Bara (including the Kordofan, Darfur and southern regions) and the Blue Nile/Rahad/Dinder area. The Um Ruwaba Formation comprises unconsolidated alluvial and lacustrine sands, silts and clays (UN 1988). It is between 150 m and 500 m thick. Gedaref, Jebel Mara, Meidobe and Bayoda basalts Tertiary Basic volcanic rocks. Horizontally to gently dipping beds. Nubian Sandstone Formation Upper Jurassic to Lower Cenozoic (mainly Cretaceous)s The Nubian Sandstone is a major regional sedimentary sequence, formed from the Lower Palaeozoic to the Cretaceous. In Sudan, the Nubian Sandstone is mainly of Cretaceous age. It covers almost one third of Sudan. It mainly comprises horizontal or gently dipping, well stratified sandstones, with layers of conglomerate and siltstone (UN 1988). It is found in the Khartoum basin, Kufra basin, Atbara basin, Blue Nile basin, Gedaref basins, Sag Elnaam basin and in Darfur. In the Khartoum basin, it exceeds 3 km in thickness. In the south, it is overlain by thick unconsolidated sediments of the Um Ruwaba Formation, while in the rest of the country it outcrops in plateaus or sub-crops below variable thicknesses of unconsolidated surface cover (UN 1988). Major faults are recognised in the Nubian Sandstone, including the Jaulia fault. Sometimes these faults displace more than 2 km of sedimentary rocks. Kabbabish and Wadi Hower formations, Gedaref Sandstone, Bentue Aradaiba, Zarga, Abu Gabra Mainly Cretaceous These formations form smaller outcrops than the Nubian Sandstone Formation, and they are not distinguished from the Nubian Sandstone on the geology map. The Kababish Formation is composed of siltstones, mudstones and fine grained sandstones, and is around 100 m thick. The Wadi Hower Formation is composed of sandstones, and is around 200 m thick. The Gedaref Sandstone Formation is located in northwest Sudan. Their thickness exceeds 100 m. There are some basic igneous intrusions within the sandstones. The Bentue, Aradaiba and Zarga formations are sandstones and mudstones of continental origin, and their thickness can exceed 5 km. The Abu Gabra is a sedimentary formation found in central-western Sudan. Erde Ente, Nawa Formation, sedimentary rocks of NW Sudan Cambrian to Carboniferous Relatively small outcrops of unmetamorphosed sandstones of Palaeozoic age occur in the west of Sudan, along the Chad border. Argillaceous Palaeozoic sedimentary rocks overlie Precambrian basement in central Kordofan. Silurian strata, largely fluvial-deltaic sandstones, occur in northwestern Sudan (UN 1988). Devonian and Carboniferous rocks, including the Nawa Formation, occur around Uweinat, Sudan. They consist mainly of sandstones with schists (UN 1988). 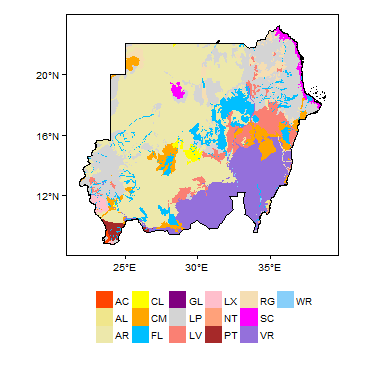 This section provides a summary of the hydrogeology of the main aquifers in Sudan. More information is available in the references listed in the Hydrogology: key references section at the bottom of this page, particularly unpublished MSc theses available through the University of Khartoum. More information on groundwater is also available from the Ministry of Irrigation and Ministry of Dams, and through bulletins of the Geological Research Authority of the Sudan (GRAS). Other references can be accessed through the Africa Groundwater Literature Archive. Low to High Productivity Undifferentiated unconsolidated sediments include alluvium, aeolian sands, and coastal sediments. Aquifer properties are variable, depending largely on their lithology and thickness, as well as recharge and connectivity with surface waters. Relatively thick, coarse grained sediments can form highly productive local aquifers. These aquifers are typically unconfined. Gezira, Atshan and Gash formations Low to High Productivity These unconsolidated sediments consist of alluvial sands, silts, gravels and clays of Quaternary to Late Tertiary age. Aquifer properties are variable, depending largely on lithology, but where the alluvium is dominated by coarser grained deposits, can be high. The aquifers are typically unconfined. Water table depth ranges from 15 m to 40 m. Boreholes range between 30 m and 150 m deep. The Gash aquifer is generally around 60 m thick. 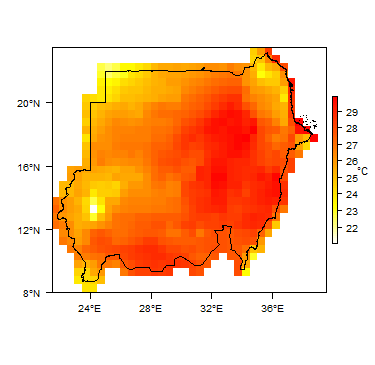 Transmissivity values of 1000 m²/day have been reported (UN 1988). The Gezira and Atshan aquifers are around 80 m thick. 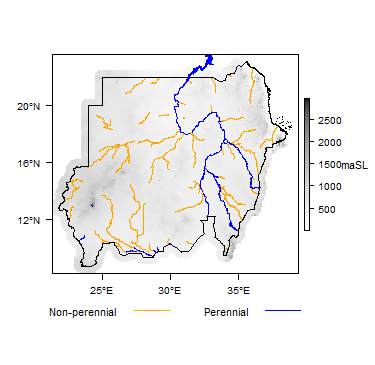 Transmissivity values of between 500 and 1500 m²/day have been given for alluvial aquifers in Darfur and the north of Sudan (UN 1988). Water quality is usually good and fresh. During high flow periods, significant recharge to the Gezira and Atshan aquifers occurs by leakage from Blue and White Nile rivers ; and to the Gash aquifer from the Gash river. Um Ruwaba Formation Low to Moderate Productivity The Um Ruwaba Formation forms an unconsolidated aquifer that covers a large area, and is generally of low to moderate productivity. The properties of the aquifer vary depending largely on lithology. Yields are generally lower than from consolidated sedimentary aquifers in Sudan. The aquifer can be unconfined, or locally semi-confined where permeable layers occur below clay strata at depth (UN 1988). Water table depth ranges from 10 m to 150 m.
The aquifer can be several hundreds of metres thick, but boreholes range between 30 m and 150 m deep. It has a maximum transmissivity of 200 m²/day, and median of 25 m²/day. The storage coefficient is typically 10-5 to 10-3. The aquifer is often in hydraulic contact with underlying Nubian Sandstone and older aquifers (UN 1988). The aquifer is used mostly for small domestic supplies and livestock watering (UN 1988). Water quality is usually good and fresh. Recharge is dominantly from rainfall infiltration, and is relatively small. Gedaref basalts, Jebel Mara volcanics Very Low to High Productivity Groundwater in these volcanic rock aquifers occurs in fractured and weathered zones. They form variably thick and variably productive aquifers depending on the degree of permeability developed by fracture and weathering, from a few metres to several hundreds of metres thick, and from very low to high aquifer productivity. The aquifers are typically unconfined. Boreholes abstracting water from the aquifer range from 10 m to 300 m deep. Groundwater quality is typically fresh in shallow zones to brackish in deeper aquifer zones. Recharge is variable depending on rainfall and surface runoff. Red Sea coastal/littoral Low to Moderate Productivity The Red Sea coastal/littoral aquifer comprises relatively consolidated marine sedimentary rocks that occur in a thin strip along the Red Sea coast, including coral limestones. Aquifer permeability and storage is low. The saturated thickness of the aquifers is typically 5 m to 20 m, although the total thickness of the geological unit can exceed 1000 m. The aquifer is unconfined and the water table typically between 10 m and 30 m below the ground surface. Boreholes are generally between 10 m and 50 m deep. Water quality is generally brackish. Recharge is low. Nubian Sandstone Formation Low to High Productivity The Nubian Sandstone Formation is a major regional aquifer. The water-bearing sandstone strata have relatively high intergranular permeability and storage. Aquifer thickness ranges from 100 m to 2000 m. Transmissivity values generally range from 100 to 300 m²/day, although values of between 35 and 1500 m²/day have been recorded (UN 1988). Specific yield ranges from 0.01 to 0.2, and storage coefficient from 10-3 to 10-4. The aquifer is semi confined to confined. In some cases, groundwater was traditionally discharged via springs. Piezometric (potentiometric) groundwater head varies from 6 m below ground surface at Wadi Howar to 100 m deep at Baggara Basin. Boreholes are generally between 40 m and 400 m deep. Recorded borehole yields are between a few m³/hour to 400 m³/hour. The Gedaref Sandstone Formation is not distinguished from the Nubian Sandstone Formation on the maps above, but also has relatively high intergranular permeability, and also forms a moderately to highly productive aquifer. 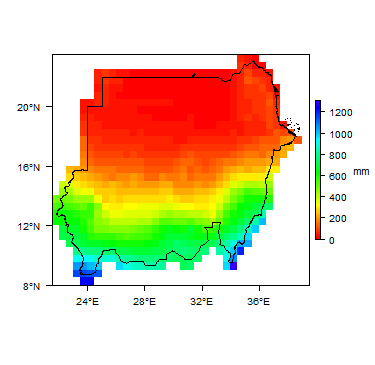 Aquifer thickness ranges from 100 m to 2000 m. Transmissivity values range from 100 to 300 m²/day. Specific yield ranges from 0.01 to 0.2, and storage coefficient from 10-3 to 10-4. The aquifer is are semi confined to confined. Boreholes are generally between 40 m and 400 m deep. Groundwater storage in the Nubian Sandstone aquifer in the Baggara basin is estimated at 1,300,000 million m³, and in the Bara basin estimated at 45,000 million m³. Groundwater quality is generally fresh, although salinity increases down-gradient and there are local pockets of higher salinity. Recharge occurs by direct rainfall infiltration and via wadi runoff, and occasionally via leakage from the Nile rivers. Annual recharge to the Baggara basin is estimated at 30 million m³, and to the Bara basin esatimated at 15 million m³. Low to Moderate Productivity This group includes all the small outcrops of Palaeozic sedimentary rocks in western Sudan. They do not form major aquifers, and little is known about them. Aquifer productivity is likely to be low and groundwater flow and storage only through fractures. Low Productivity Groundwater occurs in fractures and/or in shallow weathered zones in Precambrian bedrock, where permeability has been increased. These aquifer zones are typically between 5 m and 20 m thick, but can be thicker. Water table depths range from 4 m to 60 m depth, and groundwater is typically unconfined. Abstraction boreholes range from 10 m to 70 m, and borehole yields are generally low. The fractured/weathered aquifers have low storage potential and do not contain large amounts of groundwater. Groundwater quality ranges from fresh to brackish. Recharge is variable depending on rainfall and surface runoff. The National Water Corporation, which implements relevant legislation and manages all national water projects. The Groundwater and Wadis Department, within the Ministry of Water Resources and Electricity, conducts groundwater research, and gives advice on groundwater management and abstraction. The Specifications and Measurement Corporation sets standards for water issues in collaboration with the two institutions above. Universities conduct research into groundwater. Other ministries with a role in water resources are the Ministry of Agriculture and Forestry, the Ministry of Energy & Mining, and the Ministry of Environment and Physical Development. There are national laws governing groundwater use and management, and state groundwater laws, for example specific Nyala aquifer and Gash aquifer laws. Groundwater level monitoring is done by the Groundwater and Wadis Department in several places of interest, such as the wadis Nyala and Gash, and the Nubian Sandstone aquifer in the north of Sudan. Regular manual measurements are made and continuous recording is also done. Groundwater quality monitoring is conducted in different parts of the country by the Groundwater and Wadis Department through different programs with WES and UNICEF. Unpublished reports with results from monitoring are available at the ministries. Groundwater in Sudan is used largely for human and livestock needs, with relatively small amounts of abstraction for small-scale irrigation. The Nubian Sandstone Aquifer System (NSAS) is shared with Libya, Eqypt and Chad, and has been subject to extensive cross-border investigations and management activities. The Joint Authority for the Study and Development of the Nubian Aquifer is a transnational agency between the four countries of the NSAS, which works to study, sustainably develop and protect the aquifer system. In 2013, the four states of the NSAS and the Joint Authority signed a Regional Strategic Action Plan. The Paleozoic sedimentary aquifers in Darfur are shared with Chad. The following references provide more information on the geology and hydrogeology of Sudan. Some of these, and others, can be accessed through the Sudan country page of the Africa Groundwater Literature Archive. SFB. 1991. Geological map of Northern Sudan. More information on groundwater is also available from the Ministry of Irrigation and Ministry of Dams. ACSAD. 1987. Hydrogeological Investigations of the Nubian Sandstone Formation (Lower Atbara Basin) Sudan ACSAD-BGS-NAW, Damascus. Adam A, Kotoub S, Rasoul AW and Beidoun A. 1987. Geoelectrical Investigation of the Nubian Sandstone Formation (Lower Atbara Basin) Sudan. ACSAD-BGS-NAW, Damascus. Ahmed FD and Abu Sin MD. 1982. Water supply problems in the Butana Teion-Central Sudan with special emphasis on Jebel Qeili area: a study in semi-arid resource use. Geojournal 6 (1). Darling WG, Edmunds WM, Kinniburgh DG and Kotoub S. Sources of recharge to the Basal Nubian sandstone aquifer, Butana region, Sudan. IAEA (Ed. ), Isotope Techniques in Water Resources Development, IAEA, Vienna. Klitsch, Sonntag, Weistroffer and Elshazely. 1976. Grundwasser der zentralsahara Fossile vorraete. Geol.Rdsch, 65, 264-287, Stuttgart. Kotoub S. 1986. Groundwater Resources Investigation in Lower Atbara Basin in Sudan. Hydrogeology. ACSAD: Joint ACSAD-BGS-NAW Technical Report. Omer AM. 2008. Water resources and freshwater ecosystems in Sudan. Renewable and Sustainable Energy Reviews, 12(8), 2066-2091. Ragab ER, Mustafa E and Adam OA. 1983. Groundwater investigation Elseleim and Al Khawi basin project, Northern State, Sudan. Ground water Administration unpublished report. Saeed EM. 1976. Hydrogeology of Khartoum province and northern Gezira. Bull no. 29, Geological Research Authority, Khartoum. Tear Fund / GAD Consult. A Geophysical study for siting water wells at Abu Hadid Region in Eastern Darfur State. Most of these were completed at the University of Khartoum and can be accessed through the university. Adam NEHA. 2010. 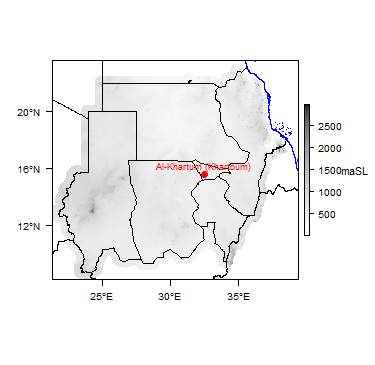 An Integrated Approach of Hydrological and Geophysical Exploration in Abu Deleig Area Sudan. BSc Honours Thesis, Al Neelain University, Sudan. This page was last modified on 19 March 2019, at 11:02.